These cuddly creatures protect and hold virtually all tablets and mini tablets including the iPad, mini iPad, Galaxy, Kindle, and more! Backpack straps allow for easy transport and hanging your tablet on car headrests and airplane folding trays. The zippered pouch keeps your tablet safe and can hold crayons, snacks, and more! There's a perfect pillow for every little one in the house!! 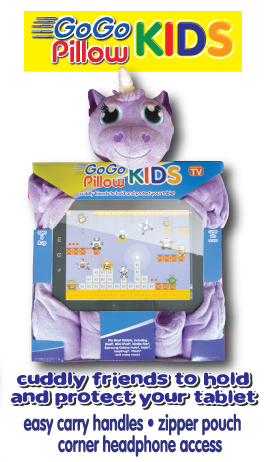 Each GoGo Kids Pillow is 18"L x 11"W x 4"D est.